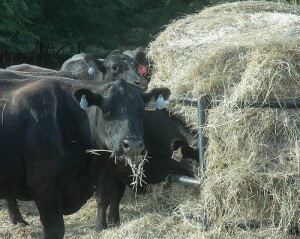 COLLEGE STATION – An inexpensive hay test can offer the best guidance as to how much supplemental feed is required for a beef cattle herd, and at the same time, save ranchers money, according to a Texas AgriLife Research scientist. Considering the historic drought conditions that prevail across Texas, Dr. Tryon Wickersham, an AgriLife Research animal nutritionist, said forage testing is even more important for cattle producers watching the bottom line. “With feeding programs being one of the most costly components of a cattle operation, every penny must be spent precisely, especially during these historic drought conditions,” Wickersham said. A hay test will reduce the likelihood of both situations, he said, noting that his recent research evaluated both variability in crude protein content and digestibility with Bermudagrass hays. The study found that increased Bermudagrass utilization (intake and digestion) with increasing nutritive value supports the recommendation of feeding high-quality hay. Wickersham said a hay test can provide information on both crude protein content and forage digestibility, if requested. He advised ranchers to test their hay to get a more accurate gauge as to how much supplement and what type of supplement to purchase and feed. In contrast, Wickersham indicated that producers with lower-quality hay will need to pay attention to providing a supplement with adequate levels of both energy and protein. In either case, a producer can make a much better decision with information on hay nutritive value. Additionally, bulk feeds can be an efficient method of feeding cow herds, but you have to have infrastructure in place to do this or evaluate the cost of adding this capacity, Wickersham said. This entry was posted on Sunday, March 18th, 2012 at 5:05 pm	and is filed under Cattle. You can follow any responses to this entry through the RSS 2.0 feed. Both comments and pings are currently closed.